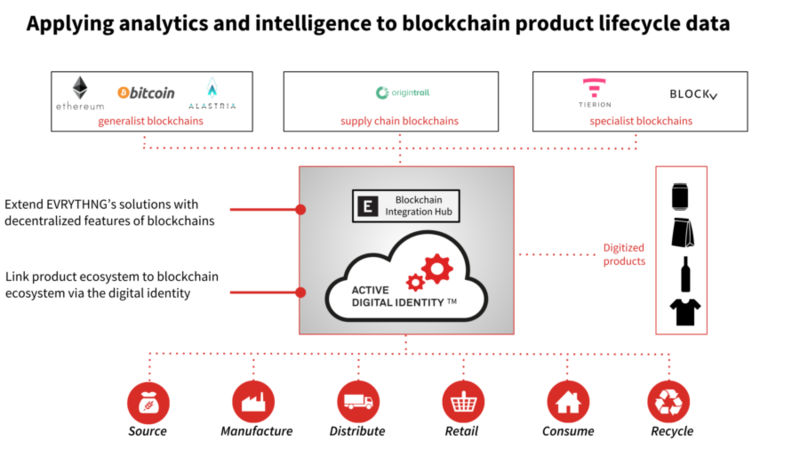 We are thrilled to announce the launch of our Blockchain Integration Hub, a milestone in our exploration of what blockchain technologies can bring to supply chain & the IoT and in particular to the digitization of CPG and apparel products. In short, the hub packages integrations with several blockchains and makes it easy for consumer product brands to rapidly test and scale applications to deliver traceability, transparency, authenticity, data sharing and reward tokens to customers through distributed ledger technologies (DLT). What really makes the hub are the integrations and partnerships we have built with great partners such as OriginTrail, Tierion and BlockV. When we started our exploration of the blockchain about 2 years ago and joined the Blockchain Research Institute to write a 35 pages report about the influence of DLT on IoT and supply chain, it became clear that blockchain was going to have an impact on our business and on our customers. It also became clear that a lot of the solutions were not ready for prime time, with significant scalability, interoperability and immaturity challenges ahead of them. This said the reality is — we rarely have a customer conversation in which the blockchain is not mentioned. 1) Re-inventing the wheel and building our own blockchain (which seems to be a trend these days…) adding another blockchain to the interoperability challenge. 2) Focusing on what we do best: providing mass-scale digital identities, intelligence and analytics for products, and partnering with a number of leading blockchain protocols and solutions to act as a “hub”, making it possible for our customers to test and combine the best of what each solution has to provide. We picked the second solution. Let me share a little more about the Blockchain Integration Hub because it is going to totally change the consumer products landscape. 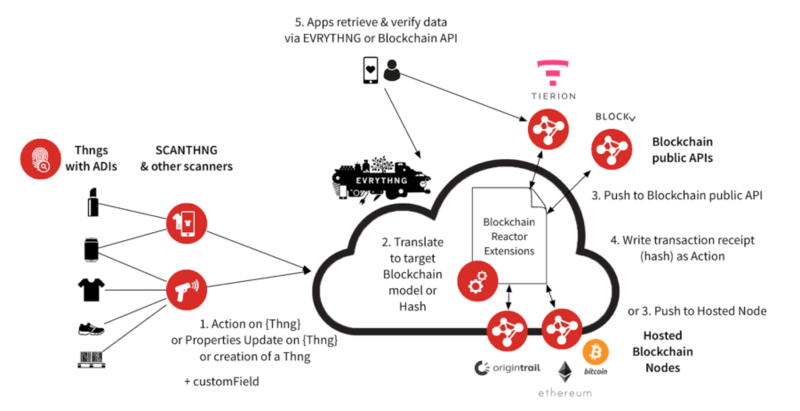 The EVRYTHNG Blockchain Integration Hub comprises of packaged scripts running in EVRYTHNG’s most popular component; our rules engine, called the Reactor. This creates a powerful and scalable integration layer between the EVRYTHNG platform and the platforms of our blockchain partners. In essence it enables Actions to be replicated (e.g., steps and location in the supply chain, consumer scans, etc.) and Properties to be updated (e.g., temperature of goods, number of steps) to different blockchains. How does it help make products smarter? This is why we are so excited! Working together we are able to extend the smart capabilities of digitized products with the decentralized features of integrated blockchains. The integration with OriginTrail allows decentralized data sharing across supply chain partners based on the Ethereum blockchain. This makes it possible for our customers to share specific parts of their data. For instance, information required for compliance purposes or data to provide greater transparency in environments where trust is lacking. The Tierion integration allows anchoring hashes of supply chain transactions to the public Bitcoin blockchain. This ensures that these transactions are immutable and cannot be modified by anyone. A useful feature when it comes to trustable product provenance data. Finally, with the BlockV integration, EVRYTHNG Active Digital Identities™ (ADI) can be linked to virtual objects that are unique, verifiable and tradable. For instance this allows embedding physical products into Virtual Reality and Augmented Reality games and creating very compelling, token-based loyalty programs. Even better, all of these features can be combined through the EVRYTHNG platform, acting as an orchestration hub! This allows interoperability across different blockchain solutions – a very important feature in the blockchain world, experiencing an unprecedented rate of innovation and change. The best place to get all the nitty gritty details is to go straight to our developer portal but let me summarize some parts of the blockchain hub integration pattern here. As mentioned before, the integrations were built using scripts running in our powerful Reactor service. This service is capable of running custom (Node.js) securely and at scale for any transaction sent to the EVRYTHNG platform: from supply chain tracking data, to consumer engaging with products and to live data from LPWAN tracked containers. This code is then responsible for translating the transactions from the EVRYTHNG model (based on the W3C Web Thing Model) to the models used by our blockchain partners. It also then pushes transactions to the selected blockchain(s). This is done either via the public API of the blockchain partner (e.g., BlockV) or via blockchain nodes hosted within the EVRYTHNG platform (e.g., OriginTrail). The script finally receives back a back transaction hash that it stores on EVRYTHNG. This ensures the transaction can be leveraged by apps using both the EVRYTHNG platform API the APIs of the blockchain platforms. As we further strengthen the integrations we will blog about each one separately here but you can already have glimpse at the Tierion or OriginTrail integration and could build your own integrations based on this pattern. What’s next? Looking for more blockchain partners! Integrations with our first partners are readily available from our developer portal but we are busy deploying new blockchain nodes and will make them available to our customers soon. We are also looking at partnering with other blockchain protocols and platforms so, if you believe you can help us making CPG and apparel products smarter with your blockchain solution, do contact us, we’d love to hear from you! Finally, after a successful real-world pilot with the now famous barry the bear, we are excited to be onboarding our first large scale customers. For instance, Almond will allow consumers to scan a unique ADI on cans of Fact, an organic, flavored water launching next week, to unlock cash reward tokens and reveal the product’s story as told through blockchain-based supply chain data.